Labrador Retriever Puppy Training " "
You need to be ready for your Labrador Retriever puppy when he comes home to live with you and your family. This doesn’t just mean having important items for your dog such as a leash, collar, food, bed and a name, but it also means being emotionally ready. Patience: Your puppy will have high energy, and will want your attention 24/7. He will likely need to be house trained, so you should expect accidents to happen in the house. If they do, don’t scold your dog, as you don’t want to give him the idea that relieving himself is wrong. Instead, learn how to properly housebreak him, and be ready to attend to his needs. In addition, a Labrador Retriever puppy loves to chew, and even if you give him plenty of chew toys, he still may get a hold of your child’s favorite stuffed animal, your underwear, the arm of your couch, or something else you didn’t want chewed. As frustrating as this will be, with patience, you will be able to live through your dog’s chewing phase. Remember, your Lab is only acting like a puppy, he isn’t purposely trying to chew up your stuff to get a rise out of you. Understanding: Your Labrador Retriever puppy will be very excitable, mischievous and have sharp senses that will make him curious and interested in exploring his new world. This means he may bark at sudden loud sounds, such as sirens, bark at his own reflection and flickering lights. Furthermore, a Lab has really sensitive hearing. Thus, you shouldn’t make loud sounds around him, especially when he is only a young puppy. This could scare him, and hurt his ears. You need to show kindness and understanding to your Labrador as he learns about his new world. Instead of viewing his excitement as an annoyance, you should encourage him by paying attention to him and taking him out to explore. Proper discipline: When your Labrador Retriever puppy does something you do not approve of, you should discipline him. Discipline does not mean you shout, yell or hit your dog. He won’t understand any of these actions, and may come to fear you, which you don’t want. Discipline your puppy by telling him in a firm, gentle tone “No”, followed by correcting his behavior. When he does what you want right, praise him a lot, so he understands. Your puppy only wants to please you. He isn’t trying to make you angry, he is only learning. Thus, you should also only discipline him when you catch him doing something wrong. Disciplining after the fact will only confuse your dog. Family education: Make sure everyone in your family knows all about the Labrador Retrieve puppy and how to care for him. This means teaching your children how to play with the dog, when to leave him alone, and about what not to feed him. Welcoming your Labrador Retriever puppy home is a lot of fun and work. It’s an adjustment for everyone. Take it slow and spend plenty of time getting to know one another. 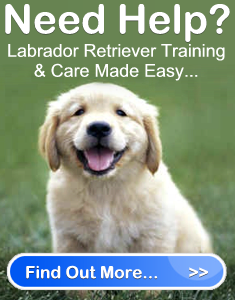 Labrador Retriever Puppy Training	Overall rating:	4.8	out of 5 based on 64	reviews.